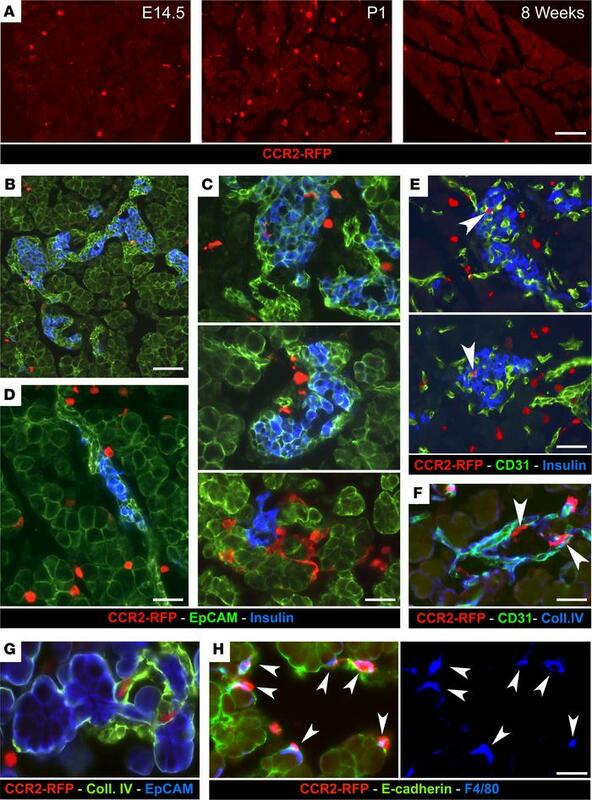 Localization of CCR2+ myeloid cells in the pancreas. (A) Pancreatic sections from E14.5, P1, and adult CCR2WT/RFP mice, stained for RFP to visualize CCR2+ cells in situ. (B–D) Pancreatic sections from P1 CCR2WT/RFP mice stained for RFP, insulin, and the epithelial marker EpCAM. (E–H) The same tissue sections stained for RFP, insulin, and the vascular markers CD31 (E) and collagen IV (F and G), or the epithelial marker E-cadherin and the macrophage marker F480 (H). CCR2–RFP+ cells occupy the interacinar and peri-islet interstitial space (B–D), outline the extraluminal side of blood vessels (E and F, arrowheads), or line Ep-CAM+ and E-cadherin+ epithelial clusters (G and H, arrowheads). Most CCR2+ cells coexpress F480 (H, arrowheads). Scale bars: 50 μm (A); 40 μm (B); 25 μm (C–F); and 20 μm (G and H). Representative of n = 10 experiments.